Since June 2017, six additional weather and climate events impacted the nation that had direct, total costs exceeding $1 billion. 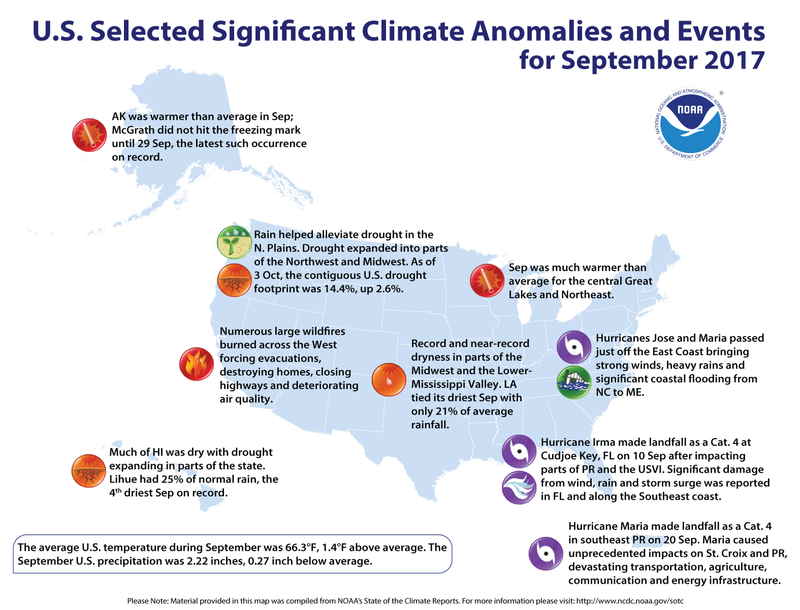 These new events included the western U.S. wildfires, the Northern Plains drought, a severe weather event in the Midwest, and major Hurricanes Harvey, Irma, and Maria. This brings the year-to-date total to 15 separate billion-dollar weather and climate disasters, tying 2011 for the record number of events during January–September. The record number of billion-dollar disasters for a calendar year is 16 events set in 2011. Cost estimates associated with the 2017 hurricanes will be available in January 2018. The September nationally averaged temperature was 66.3°F, 1.4°F above the 20th century average, and ranked among the warmest third of the historical record. Near-record warmth was observed in parts of the Great Lakes and Northeast. The year-to-date U.S. average temperature was the third warmest on record at 57.7°F, 2.7°F above average. Only January–September of 2012 and 2016 were warmer. Above-average temperatures spanned the nation for the first nine months of the year. 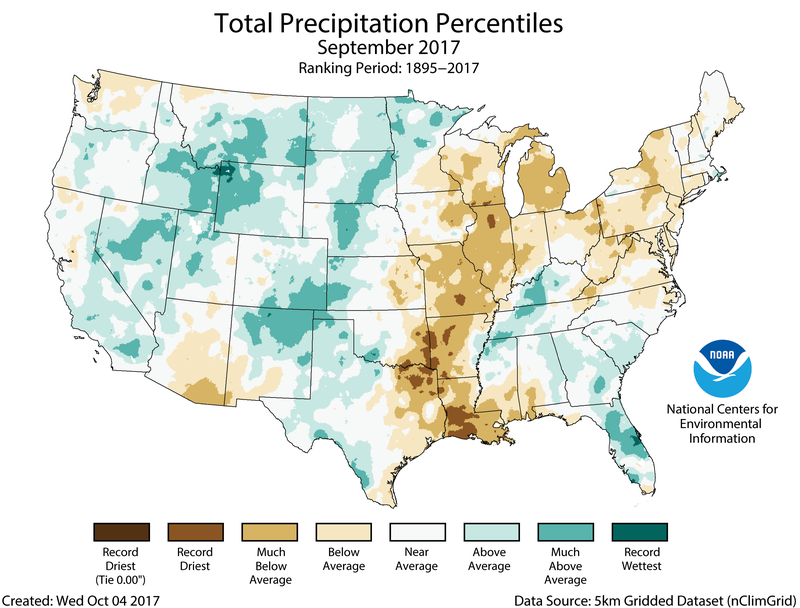 For September, the national precipitation total was 2.22 inches, 0.27 inch below average, and ranked among the driest third of the historical record. Much-below-average precipitation fell in the Lower and Mid-Mississippi Valley and the central Great Lakes with above-average precipitation for the Rockies, Northern Plains, and Southeast. The year-to-date U.S. precipitation total was 26.36, 3.16 inches above average. This was the wettest January–September on record, surpassing the previous record set in 1979. See all September and year-to-date U.S. temperature and precipitation maps. The temperature pattern across the contiguous U.S. shifted dramatically in mid-September. Early in the month, record and near-record warmth spanned the West with below-average conditions across the East. For the last two weeks of September, record or near-record warmth was observed in the East with below-average temperatures in the West. 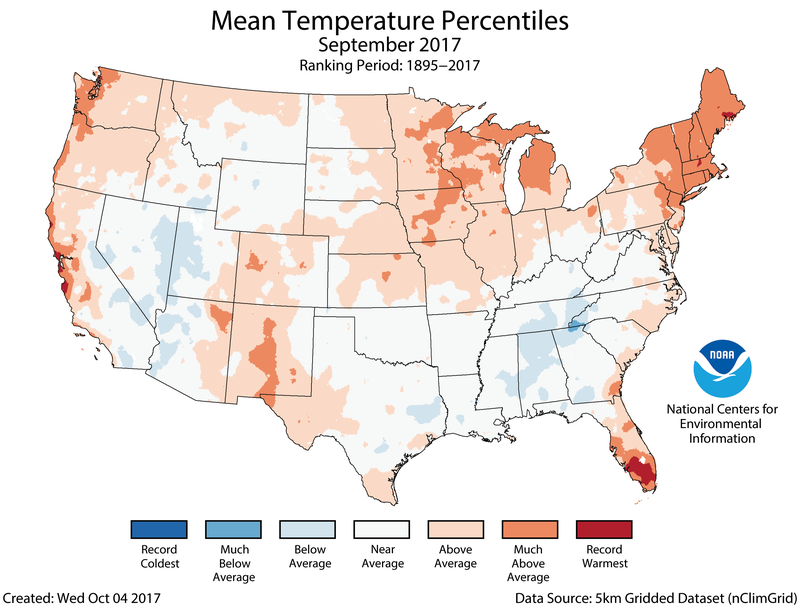 This pattern caused many states to have near- to above-average temperatures for September with much-above-average temperatures in the central Great Lakes and Northeast. During September, the Alaska statewide average temperature was 42.8°F, 2.2°F above average. North-central and southeastern Alaska were much warmer than average. The temperature in McGrath did not drop below the freezing mark until September 29, the latest such occurrence on record. The previous record was September 25, set just last year. Below-average precipitation was observed for the mid- and lower-Mississippi Valley stretching into the Great Lakes and Northeast where five states were much drier than average. After having its second wettest August, Louisiana tied its driest September on record. The Louisiana statewide average precipitation total was 0.87 inch, 3.25 inches below average, tying 1953 as the driest on record. 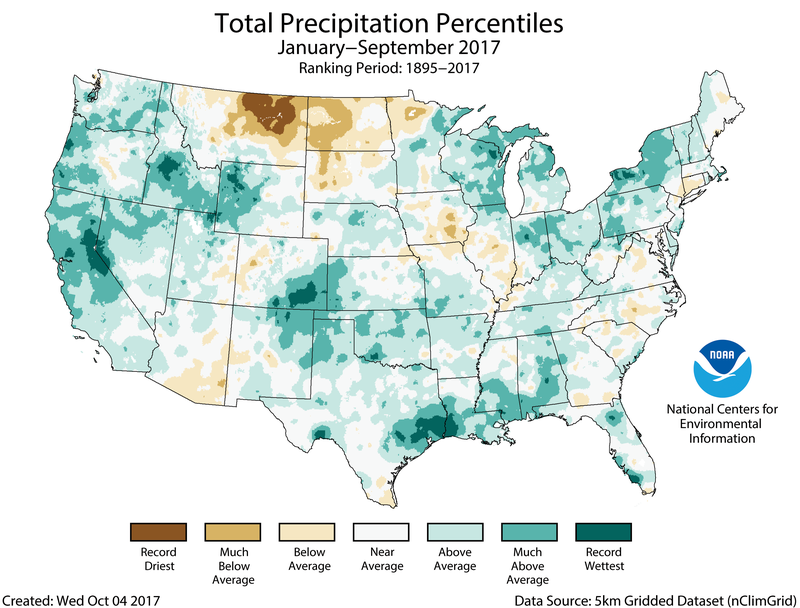 Above-average precipitation was observed for a large area extending from the Great Basin, through the Rocky Mountains and into the Northern Plains. Parts of the Southeast were also wetter than average. Wyoming was the only much wetter than average state. Many mountain locations in the West received their first snow of the season. According to the October 3 U.S. Drought Monitor report, 14.4 percent of the contiguous U.S. was in drought, up nearly 2.6 percent compared to the end of August. Drought improved across parts of the Northern to Central Plains. Drought conditions expanded and intensified in parts of the Northwest, Midwest, and Southern Plains. Outside of the contiguous U.S., drought conditions were alleviated in southern Alaska and southern Puerto Rico but expanded in parts of Hawaii. September was an extremely active hurricane month for the North Atlantic Basin with five hurricanes – four of which were major hurricanes. One measure of tropical cyclone activity – the Accumulated Cyclone Energy (ACE) index, which takes into account the combined strength and duration of tropical cyclones – was record high in the North Atlantic during September. Hurricane Irma devastated parts of Puerto Rico, the U.S. Virgin Islands and Florida. Then Hurricane Maria delivered a second punch, causing unprecedented impacts on Puerto Rico and the U.S. Virgin Islands. 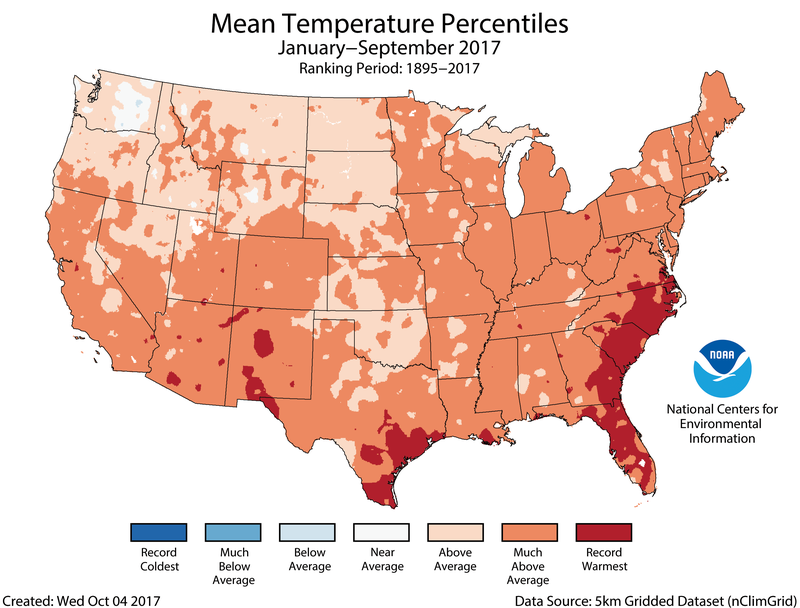 Every state across the contiguous U.S. had an above-average temperature for the first nine months of the year. Forty-one states, stretching from coast to coast, had much-above-average temperatures for January-September. Three states in the Southeast – Florida, North Carolina and South Carolina – were record warm. Most locations had wetter than average conditions during January-September. Much-above-average precipitation was observed across the West, and parts of the Southern Plains, central Gulf Coast, and Great Lakes. Eleven states were much wetter than average, while no state was record wet. Conversely, below-average precipitation was observed across the Northern Rockies and Northern Plains. No state was record dry. The U.S. Climate Extremes Index (USCEI) for the year-to-date was the third highest value on record at over one and a half times the average. On the national scale, extremes in warm maximum and minimum temperatures, one-day precipitation totals and landfalling tropical cyclones contributed to the elevated USCEI. The USCEI is an index that tracks extremes (falling in the upper or lower 10 percent of the record) in temperature, precipitation, drought and landfalling tropical cyclones across the contiguous U.S. According to the October 2 U.S. Drought Monitor, moderate to exceptional drought covers 24.6% of the United States. According to the May 22 U.S. Drought Monitor, moderate to exceptional drought covers 26.7% of the contiguous U.S.
On the morning of March 28, 1964, without warning, the largest recorded earthquake in U.S. history struck Alaska’s Prince William Sound.